Regular readers of my reviews know I love character and thematically driven anime—but that’s not to say I don’t enjoy a good, straight-up adventure when I come across one. And that’s exactly what Chaika: The Coffin Princess is. After the defeat of the evil emperor, the world has transitioned into an uneasy peace. When out-of-work soldier Toru comes across a lost girl wandering in the woods—and carrying a large coffin—he decides to join her on her quest to find the pieces of her father’s corpse so that she can give him a proper burial. Of course, this may be easier said than done as her father was, in fact, the aforementioned evil emperor and his body parts are a tremendous source of magical fuel. Together, Chaika, Toru, and his sister Akane set out to gather the corpse pieces from the heroes who killed Chaika’s father while at the same time trying to avoid the government agents sent out to capture her. Chaika is one of those anime that knows what it is—a fantasy adventure—and embraces that to its fullest. It is not concerned with trope deconstruction or attempting to be shocking or edgy at every turn. Rather, it is a solid plot-driven anime full of exciting adventures that also explores the mysterious pasts of the various characters—and the secret behind Chaika herself. That's not to say that the series doesn't have its plot twists and surprising moments; but these are the icing on the “fantasy-adventure” cake, not the cake itself. Chaika is an interesting character in that she is basically innocence personified. There is not a suspicious or untrustworthy bone in her body. Thus, she takes everything at face value and is shocked when people do not live up to her “lawful good” expectations. She is an excellent counterpoint to the far more pragmatic Toru or Akane who, as soldiers, have seen the worst humanity has to offer on countless occasions and thus never shy away from the violent path. 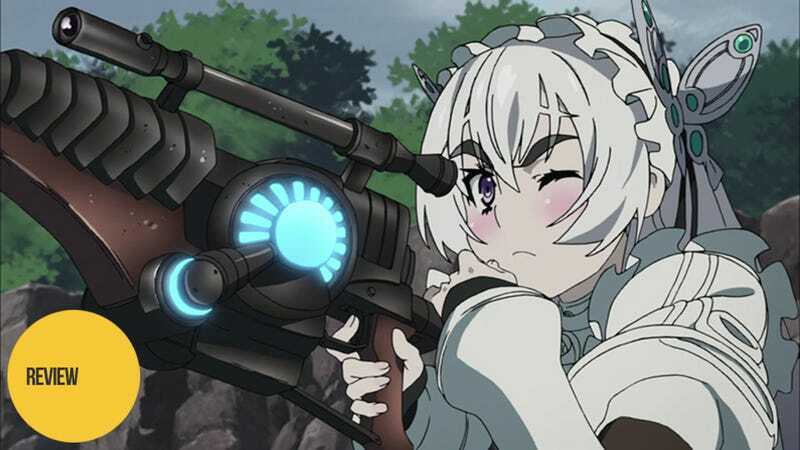 Moreover, as the series goes on and the various main antagonists appear, their interactions with Chaika become the most intriguing aspect of the show. The uncanny similarities between Chaika and them are contrasted by the profound differences in their world views. Every conversation between Chaika and one of the main antagonists serves to not only develop him or her, but also Chaika as she is constantly forced to confront a mindset far less innocent than her own. Toru begins the series as a broken character. Skilled in war to the point of being largely unstoppable on the battlefield, he finds himself unable to adjust to a peaceful life. He is unable to hold down a job and is completely dependent on his sister for room and board. Moreover, Toru is completely aware of his shortcomings and is surprised that his sister stays by his side despite them. He clearly has a low self-esteem when it comes to his inability to live a normal, peaceful life. So when Chaika appears, she represents the return to a life he understands—one of danger, violence, and a clear purpose. In her, however, he doesn't just find the way to a new battlefield; he finds someone who needs not only his skills but him as a person. Toru is far from the only person in the series who has difficultly finding his place in a peaceful world. Nearly every member of the main and supporting cast is driven by a similar inner conflict. Fredrika, the final member of the party, mourns the loss of her partner from the war but joins Chaika's group in hopes of gaining a similar bond again. The group of heroes hunting Chaika is made up mainly of outcasts who have found a post-war home in each other, thanks to their leader bringing them all together. In this group they are accepted by their peers, have a leader they respect, and are given the chance to do something good for the world. Even the villains of the story share this impetus. Whether they are fallen heroes corrupted by the spoils of war or are those like Toru who believe that they are only useful in war, the motive behind their actions on the most basic level is trying to make the world—and their lives—make sense again. It’s a feeling everyone can relate to. Chaika: The Coffin Princess is a fun ride. It doesn't do anything particularly special or novel and it doesn't need to. If you are looking for a good fantasy adventure with interesting characters, great twists and turns, and a lot of imagination, you should definitely give this one a shot. Chaika: The Coffin Princess aired on Tokyo MX in Japan. It can be viewed for free with English subtitles in the US on Crunchyroll. For a second opinion, check out the review on TAY, Kotaku's own user run blog.